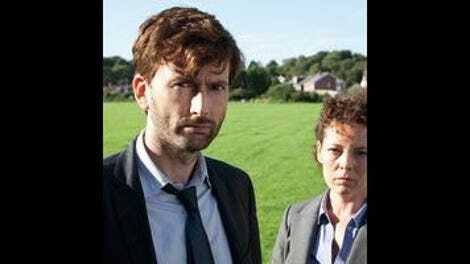 The riveting British drama Broadchurch begins with the gruesome murder of 11-year-old Danny Latimer, and never relents. 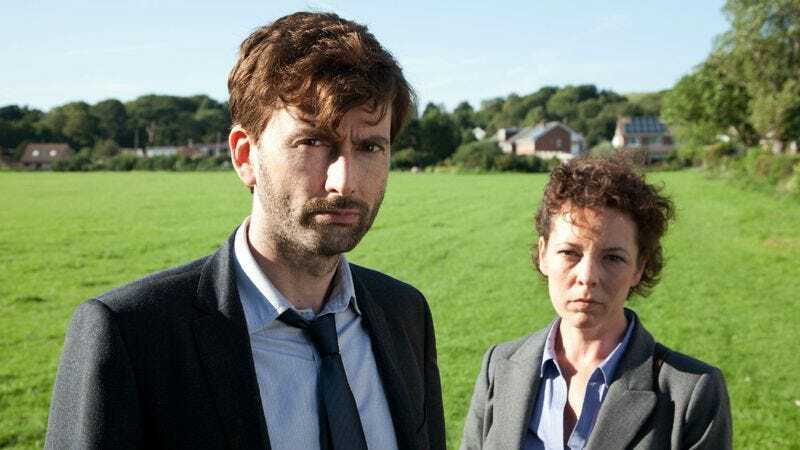 After discovering Danny’s tragic fate in last week’s première episode (many thanks to Alasdair Wilkins for starting us off with such an excellent exploration of episode one), the entire world of the town of Broadchurch is turned upside down. In a small community like this one, if one person is in peril, then everyone is. If Danny’s killer is one of the townspeople, then the monster must come from the inside. The list the Latimers turn over to the police as possible suspects is a list of everyone they know. By the time episode two begins, the small reminders of Danny that the family keeps running into leave the viewer absolutely gutted. Like last week’s never-eaten lunch, left on the kitchen counter, this week we spy a small shirt still waiting to be folded in the laundry, Danny’s favorite cereal on a grocery store shelf. His mother Beth (in an mercilessly agonizing performance by Jodie Whittaker) cements her status as the show’s emotional center. Fed up with being cooped up inside the house, she heads to the supermarket for crisps, where she faces a gauntlet of quizzical, demanding, and sympathetic faces, culminating in her meltdown in the parking lot. The movements of the grieving family are in slow motion, hauntingly scored, and seem almost underwater, capturing just how devastated a family would feel after such a loss. Broadchurch is an idyllic, seaside town, fictionally set on the Dorset coast in southwest England. As ambitious local journalist Olly Stevens (Jonathan Bailey) explains to investigative interloper Karen White (Vicky McClure), “It’s the only town for 20 miles, one road in, one road out.” Some residents haven’t even been 50 miles away. The sunny, cheerful setting dramatically differs from the tragedy it hosts. Show creator and writer Chris Chibnall is a playwright, which probably helps account for how the show deftly displays intimate conversations between only two or three people, set in such a wide expanse. The town itself almost seems a character, as the horrific event starts to affect all its inhabitants, fraying the connections between them. As Broadchurch begins to move past grief into investigation, the seemingly inconsequential townspeople we’ve been introduced to appear to have layers of hidden agenda: Why did the ineffectual pastor make an announcement on television? Did the postman make a phone call after being questioned by police, and why did he lie about not having an argument with the murdered boy? The pretty blonde innkeeper involved Danny’s teenaged sister Chloe in trafficking cocaine, and pauses awkwardly when asked if Danny could have been involved (bad). But she also lays into another business owner when he complains the murder is bad for business instead of focusing on helping the townsfolk (good). Given this is only week two of eight, some of these are undoubtedly red herrings, but which? It’s to the show’s credit that a subject this horrific can be so captivating. Broadchurch highlights its tremendous production quality (kudos to the set designers, creators of the moodiest police station ever, and the composers of that sad, spooky, score) with shocking, gasp-worthy moments. For example, we know that Danny’s mobile phone and skateboard, both of which were on him the night he died, have not been discovered. Detective Hardy visits the trailer of the scowly lady who cleans the beachfront hut (where, we learn, Danny met his demise). The music swells to a completely predatory level while she looks through a box in her closet for the keys to the hut Hardy’s asked for. Then we see why: the most ominous skateboard in the world resides in that closet. What’s exemplary (and sadly unique) about Broadchurch is that its patience and meticulousness demand so much from its audience. Who is the pretty young girl in Hardy’s wallet, and was she the owner of the pendant the self-professed psychic mentioned? What did Tom delete so swiftly from his phone and computer last week? Is reporter White a ghoul for swiping Danny’s teddy bear from the crime scene memorial, a saint for giving it to Danny’s sister, or an opportunist for using it as a way in to Danny’s family? So many shows would connect the dots for us, but here nothing is spelled out, no paths are paved, and we are left to draw our own conclusions. No doubt Broadchurch will keep us guessing and surmising until the very bitter end. Until next week: I’ll be over here hanging onto the edge of my seat. Reasons D.I. Hardy would not make the best coworker: doesn’t drink coffee, doesn’t say thank you when brought fish and chips, doesn’t ask if anyone else would like a cup of tea when he makes one for himself, asks incessant lists of questions without giving anyone a chance to answer, sometimes gets dizzy whilst pondering his tea cup. Intriguing camera angles: the close-up on Tom’s hands circling his glass of orange juice when his parents tell him he called out Danny’s name in his sleep, the shot of Chloe in the rearview mirror of the motorbike, which looks like someone could be watching her, but who? In a show low on smiles (laughs are pretty much out of the question), viewers must be grateful for the insertion of Pete (Marcus Garvey), the family liaison police officer, who’s specially trained, just taken a course. “You’re my first!” he tells the grieving Latimers cheerfully, as Detective Miller’s crestfallen face falls even further. So far his duties seem to involve trying to keep the family inside the house at all costs, and making tea. Minor nitpicks: Granted, in the first 48 hours of a tragedy-stricken family, who knows what could be going through everyone’s minds? But, if I’m a sneaky teenage girl (and I was), I would figure that my house would be searched and would get rid of my drugs somewhere. If I’m a detective and I want to go off having private chats with family members, I would not do it in places that are in plain sight of other family members peering anxiously from windows. And, if I’m a parent, I would make sure my alibi for the night in question could not be punctured like a balloon, as everyone knows that the immediate family is always the first house under suspicion. Praying that’s not where this show is going (although, let’s not forget that Mark Latimer [Andrew Buchan] was the only family member to verbally protest being fingerprinted). But with Broadchurch, it’s impossible to tell. For a tragic real-life example of how an event like this can unravel the stability of an entire community, CNN’s website currently features a five-part series on the “coldest case ever solved.” The case was a child abduction in Sycamore, Ill., which devastated the small town and was considered the area’s defining moment by many of its residents for decades.